With 20 classes per week to choose from you will find times that work with your schedule. Our group classes are unique, you will never have the same routine twice! No boredom at MissFit – we keep you on the move at every class. The reason for my post is that it was 12 months ago last week that I became friends with Kate on Facebook! And I must say that I have thought of her every day since! Sometimes it’s a grumble! Like when I wake in the middle of the night because my legs are sore or have to walk up and down those stairs. But mainly it’s because of the positive influence she has had on me. I joined MissFit over a year ago now. I’d had some issues with my previous Gym and after looking for a few weeks, then one visit to MissFit I realised this was the place for me. We started training together at MissFit five months ago and cannot speak highly enough of Kate and the lovely MissFit team. We love the variety and challenge of every session and the support of the MissFit community. Hi my name is Gaby. I am approaching my 2nd anniversary with MissFit. Elly joined MissFit in December 2015, and when she continued to rave about it, Marissa wondered what all the fuss was about, and decided to give it a go. It didn’t take her long to see why Elly had become a fan, and she soon shared the MissFit addiction and decided to join the team. I have been training for competitive rowing at a national level for the past 12 years. During this time, I fell pregnant with my beautiful daughter, and underwent breast cancer treatment at the same time. My main goals were to be able to be fit enough to play Centre for a whole netball game and to participate in Miss Muddy 2015. I reached both these goals much quicker than I had expected and on top of this I have never felt stronger!! This is due to my new-found love of weight-training which is owed to the MissFit team for constantly surprising us with new ways of working out the same muscles and making the whole ordeal enjoyable. 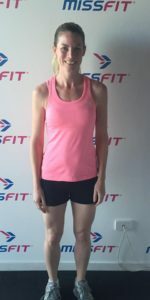 To be honest, I initially chose MissFit for convenience – it was close to home and I could bring my baby along whilst I exercised – female only fitness classes were really not my thing (boxing being my exercise of choice), so my expectations were not high. 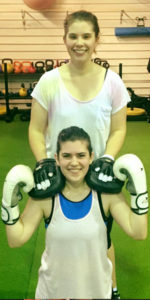 Pretty soon after starting at MissFit any misconceptions I had were completely blown out of the water – these girls cou.